After working for over three decades in healthcare and experiencing what is is like to find senior living for her mother, Paula Sotir invested in a CarePatrol franchise in 2014. She shared her advice for franchisees and her franchising experience with Franchise Business Review. What specific business advice do you have for franchisees? Be passionate about the business first. Commit your time and resources to building the business and the team. Develop a vision, values, and expectations, and then exemplify them. What are you most proud of overall when it comes to your career in franchising? Developing a brand in Baltimore that is known for going the extra mile and helping most folks regardless of financial capabilities. I am also proud of everyone on our team. They believe in our vision and value and it's wonderful to watch them meet their personal and professional goals. We also exceeded our 2nd year and 3rd year budgets and won the Franchise of the Year in 2016. I wanted to find a business that would benefit from my past experiences and knew I wanted to help folks with their senior living choices. I had helped my mother and knew how hard the process could be. Why did you select the franchise brand you did? I had over 35 years in health care and a background in operations, sales, and new business. I wanted to find a business that would benefit from my past experiences and knew I wanted to help folks with their senior living choices. I had helped my mother and knew how hard the process could be. I researched options and then chose CarePatrol due to their high franchise ranking and strong, positive growth curve. 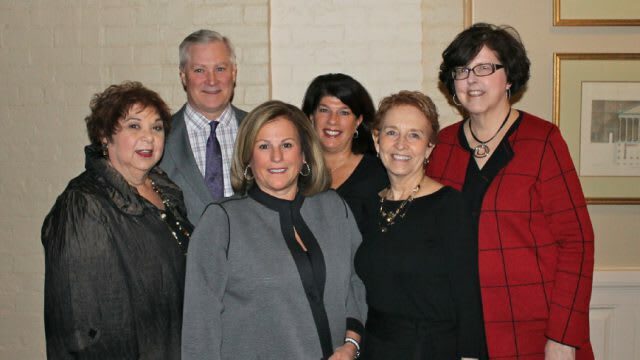 After working in healthcare and having to find senior living for her mother, Paula Sotir (front, second in from left) invested in a CarePatrol franchise. What kind of support from your franchisor has contributed most to your success? One of the things that I liked about CarePatrol is that they required all of the owners to have a certification as a Certified Senior Advisor (CSA). I felt this showed their commitment to excellence and higher learning. I attended and passed the CSA course before my initial training at the corporate office. We had a week of training in their corporate office and I immediately felt like I was on a team that would succeed. Incidentally, three of the owners in that class are now in the list of top five franchisees. We then had weekly calls to review the material. There was a corporate trainer that came to Baltimore to train. Just as important as the corporate training was meeting Bonnie Danker from Howard and Montgomery County. She had been covering the entire state of Maryland and had a wonderful reputation. She helped me to understand the territory as well as the process and supported me all the time. Finally, the CEO made the decision to allow the franchises their own web site developed by the corporate office. It continues to give CarePatrol Baltimore the competitive advantage over the individual placement companies and other franchise organizations in our sector. You can see the professionalism of our site by visiting www.carepatrolbaltimore.com. Our business has given me and my team great personal satisfaction as a result of helping and supporting clients and their families through such difficult times. How do your fellow franchisees help you succeed? The Maryland franchise group works really well together. We refer to each other and know that the brand, quality, and process will be consistent in all regions. We also support each other when it comes to difficult clients and emotional support. Has franchising met your personal and financial goals? Our business has given me and my team great personal satisfaction as a result of helping and supporting clients and their families through difficult times. When families say I was so overwhelmed, we could never have done the placement without you, or when social workers say CarePatrol has helped them meet the needs of their patients, or when a Director of Social Workers says your services are above all your competition, it makes you smile and you continue to put in the long hours. My feeling is that if you continue to help individuals and go the extra mile, your financial goals will be achieved. That has happened for us at CarePatrol Baltimore. Before investing in CarePatrol, Paula researched it extensively. Below is information that will help you get started on your research. You can see how CarePatrol's franchisees ranked it in area’s that are crucial to the health of a franchise including leadership, culture, and training, by reading its full franchisee satisfaction report. For more information about franchising with CarePatrol you may call 480.626.2450 or visit DiscoverCarePatrol.com.